Even though he didn't help them get to the World Series in "The Year of the Pitcher," the ace of the Philadelphia Phillies will grace the cover of next year's version of 2K Sports annual baseball title. It was a great year for baseball. There were six no-hitters thrown, including two perfect games (27 up, 27 down) and a perfect game that should have been before an umpire botched the call for what would have been the last out. To put that in perspective, there have been 20 such perfect games in the history of the game, and two of those occurred this season. Roy "Doc" Halladay threw two no-hitters in 2010, including one of the perfect games in addition to only the second no-hitter in post-season history. Even though the Phillies ended up losing to the Giants in the NLCS, Halladay is a candidate for the National League Cy Young Award, which is announced tomorrow. 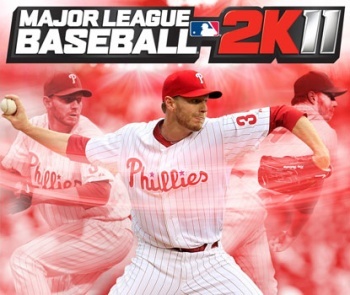 With 2K Sports MLB series recent concentration on its "Total Control Pitching," it makes perfect sense for a pitcher to grace the cover of MLB 2K11 and Halladay is a perfect (har har) choice. "I'm honored to be on the cover of Major League Baseball 2K11," said Halladay. "I'm not one for predictions, but should 2K Sports be right about tomorrow, well, that would be a great way to end the year." Halladay was cool as a cucumber after he threw his perfect game, so of course he's humble about being picked to appear on the game's cover as well as his Cy Young prospects. "In the 'Year of the Pitcher', Roy has truly distinguished himself as the best pitcher in baseball," said Greg Thomas from 2K. "Between his dominating season that included baseball's 20th perfect game, and his exciting performance during the postseason, we believe there is no player more worthy of representing our revolutionary pitching mechanic on the cover of Major League Baseball 2K11 than Roy Halladay." 2K said that the title will be available on all of the consoles as players report to spring training next year, but there is no word on whether MLB 2K11 will support PlayStation Move or Kinect. I may be in the minority, but I found pitching and hitting with the Wii Remote to be a lot of fun, and I hope that 2K figures out a way for the other motion control schemes to be utilized in 2011.